Dog Mountain returns home to the Philly Improv Theater (PHIT) stage after an incredible journey on the 2016 sketch comedy festival circuit with appearances at the North Carolina Comedy Arts Festival and Philly Sketchfest. More importantly, their return comes with a set of brand new material entitled, “Trucker BBQ”. 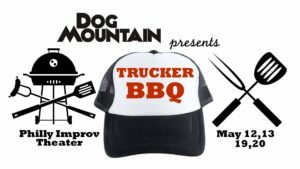 Directed by Carl Boccuti, Dog Mountain” target=”_blank”>Dog Mountain‘s “Trucker BBQ” is written & performed by Chip Chantry, Jim Grammond, Emily Hill, Julia Hudson (Sweetish / Barbara Bush), Trevor Miles (Daring Daulton), Joe Moore, Courtney Painter (Barbara Bush), RJ Payne, Steve Swan (Hoagiefist), and Ashlee Rose Toll. Opening for Dog Mountain this week, and debuting their first show as a group, is Nakatomi. 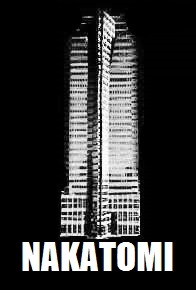 Formed by established, Philly-based improvisors, Nakatomi is written & performed by Sam Abrams, Sarah Clemency (Kathryn & Sarah), Andrew Coppola, Kate Fruhman, Tom Hannigan, Sheila Master, Rob O’Neill (A Galaxy Uncherished) and Joe Tuzzi. Returning even more recently from the 2016 sketch comedy festival circuit with an appearance at this past weekend’s Charm City Comedy Festival, is it’s the new with their FREE monthly sketch comedy event at Northern Liberties Recreation Center. 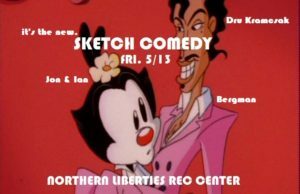 Now in their second month, this FREE TO ATTEND monthly sketch comedy showcase features performances from sketch groups, Bergman (Beth Eisenberg and Karen Coleman), Jon & Ian Have Something to Tell You (Jon Plester & Ian Fletcher), and the host of Monologues at PHIT, Dru Kramcsak (it’s the new.). This is an all-ages recreation center so we want to make sure we help spread the word that NO alcoholic beverages are permitted at the Northern Liberties Recreation Center and that some content may be unsuitable for children under the ages of 16.